On 02/23/2011 Khalid Ali‐M Aldawsari (pictured left), a Saudi national currently attending college at South Plains College, near Lubbock, Texas, was arrested on federal terrorism charges. Aldawsari was charged with attempted use of a weapon of mass destruction (WMD), in connection with the alleged purchase of chemicals and equipment necessary to make an improvised explosive device (IED), in addition to research into possible U.S. based targets. Court documents advise that Aldawsari had performed internet research on how to construct an IED, using chemical components. It has also been alleged he had acquired/taken major steps in acquiring the necessary components and equipment needed to build such a device. According to court documents, on 02/01/2011 a chemical supplier reported to the FBI a suspicious purchase of concentrated phenol, by a man named Khalid Aldawsari. Although the toxic chemical phenol can have legitimate uses; it can also be used to make explosives. Concentrated sulfuric and nitric acids, beakers, flasks, clocks, wiring, and a Hazmat suit were found during 2 FBI searches of Aldawsari’s apartment. 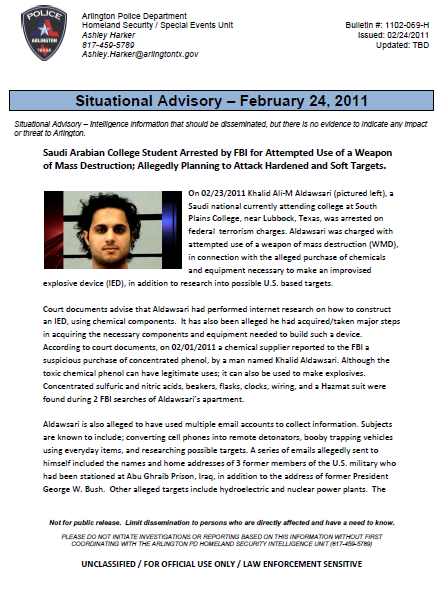 Aldawsari is also alleged to have used multiple email accounts to collect information. Subjects are known to include; converting cell phones into remote detonators, booby trapping vehicles using everyday items, and researching possible targets. A series of emails allegedly sent to himself included the names and home addresses of 3 former members of the U.S. military who had been stationed at Abu Ghraib Prison, Iraq, in addition to the address of former President George W. Bush. Other alleged targets include hydroelectric and nuclear power plants. The suspect is also alleged to have conducted research into the use of dolls to conceal explosives, in addition to the possible targeting of a nightclub, via an explosive device in a backpack. This incident highlights the need for Arlington Police Department (APD) to remain vigilant to any unattended packages/items left in key areas, in addition to suspicious behavior. Remaining engaged and continuing to work with the citizens and private businesses of Arlington, Texas is a key factor in helping to secure the community. There are currently no indications that Aldawsari received any kind of operational direction from a foreign terrorist group, rather that he was operating in a “lone wolf” capacity. However, a recent issue of the magazine published by al‐Qaeda in the Arabian Peninsula encouraged jihadists to attack “soft” targets, including but not limited to restaurants, banks and global corporations.